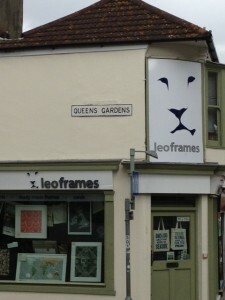 I walked past this shop when I was in Brighton the other day, and was struck by the simplicity of their logo. With just a few black-and-white squiggles, you ‘see’ the proud face of the King of the Beasts. When I draw a mouse, I just include a pointy nose, two little round ears, one S-shape to show the curve of its back, and another S-shape to show its long tail. Everyone knows what it is, even though my drawing doesn’t have a face, whiskers, belly, legs or feet. Look at the smiley face in my logo. It doesn’t have eyes (I didn’t include them because I was worried it would look too druggy). It doesn’t have a nose. But it still looks like a face. The only important element is the smile – I wanted it to represent positivity and happiness, and suggest a pleasant working experience and successful results. Similarly, if you look at the four dots below, chances are you will see a square. This effect is explained by Gestalt theory: ‘The whole is other than the sum of the parts’. There are some interesting examples on Wikipedia. Because my fascination with (and training in) psychology informs all the copy and design recommendations I make for clients. Because it’s the reason why I always make things as simple as possible (I call it Writing Without Waffle). Because you can use this idea to benefit your own logo designs and marketing content. You only have to provide a minimal amount of information as your reader’s brain will fill in the gaps.